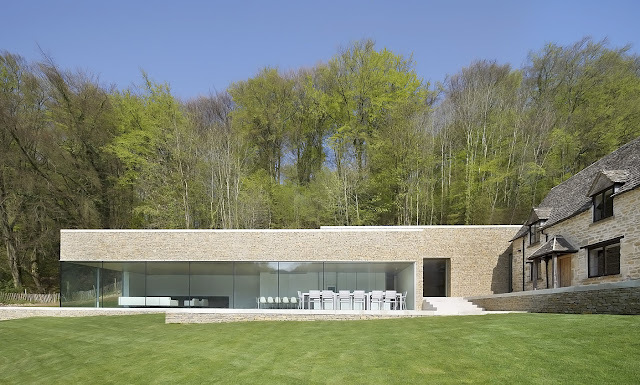 This contemporary, new build house, designed by Found Associates, is situated within an idyllic setting on a wooded valley, overlooking a 13th century fish lake in Cotswolds, Gloucestershire. 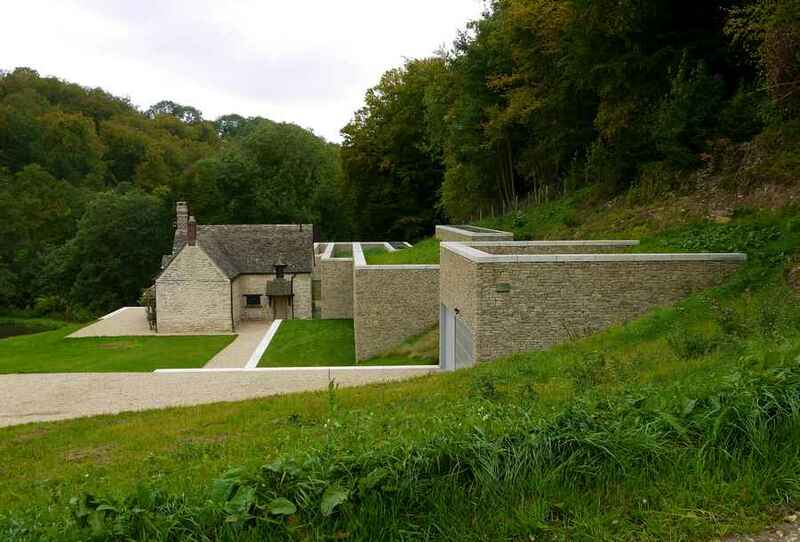 The Cotswolds are a range of hills in southwestern and west-central England, in a designated area of Outstanding Natural Beauty. 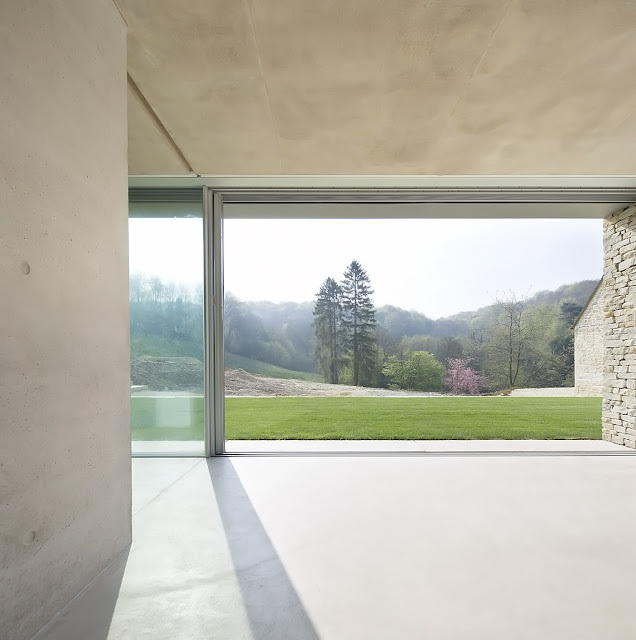 The residence is a large low lying structure of concrete and dry stone walls that blends harmoniously with the surrounding landscape, in a modern interpretation of the local vernacular. 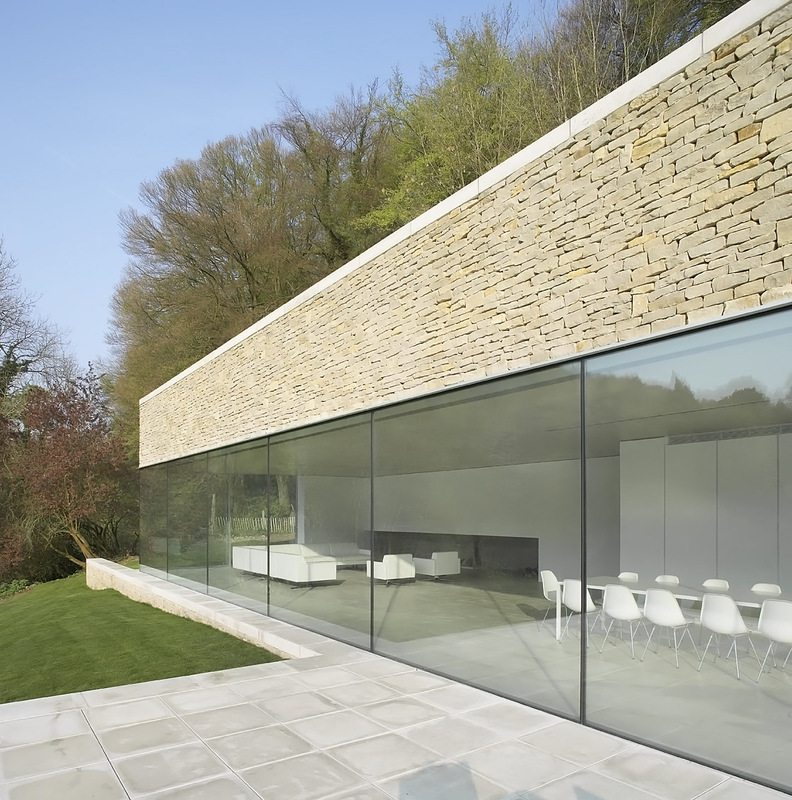 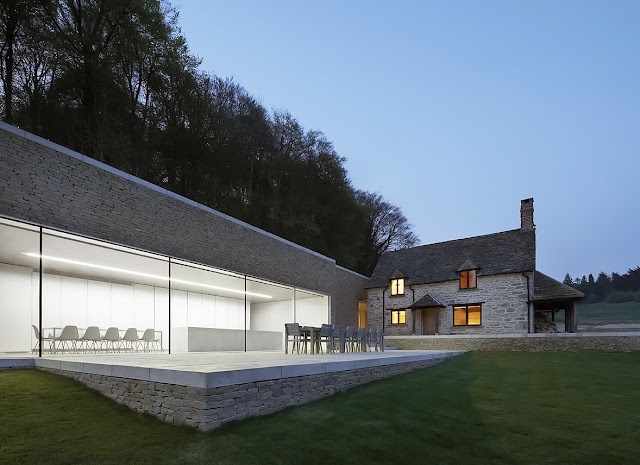 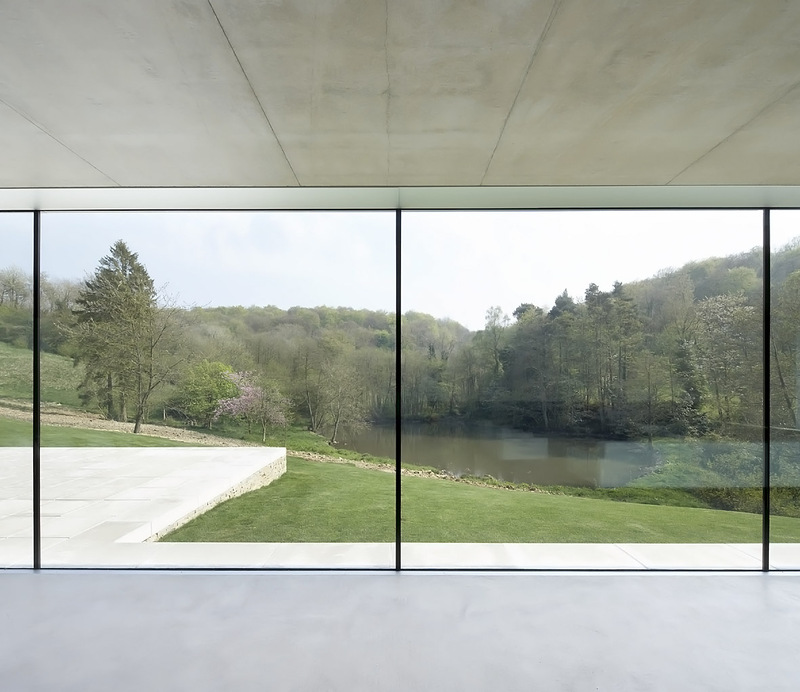 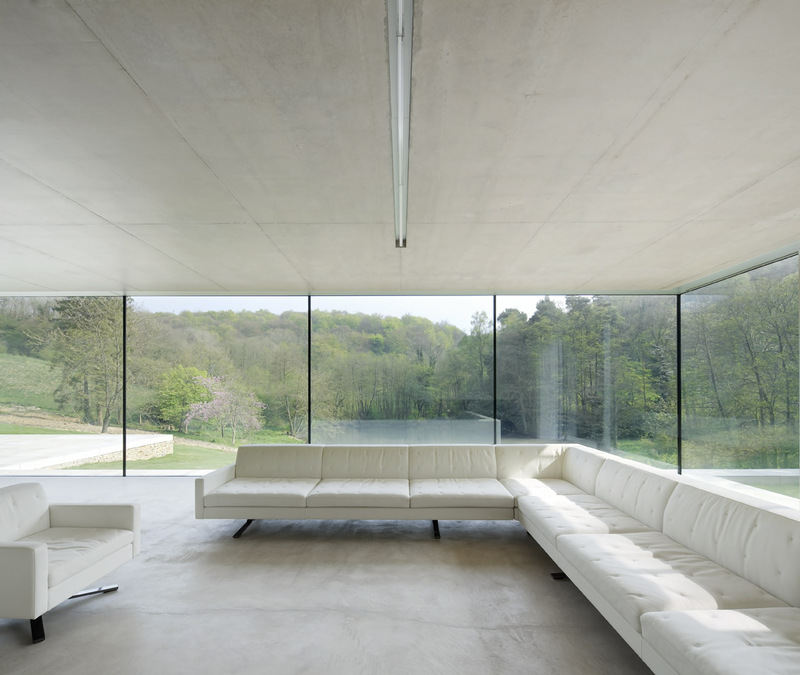 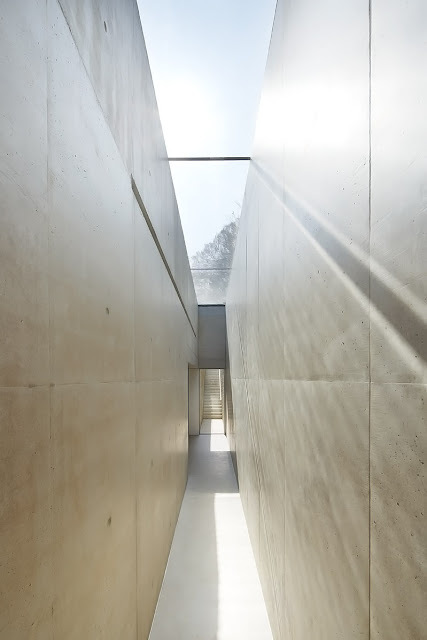 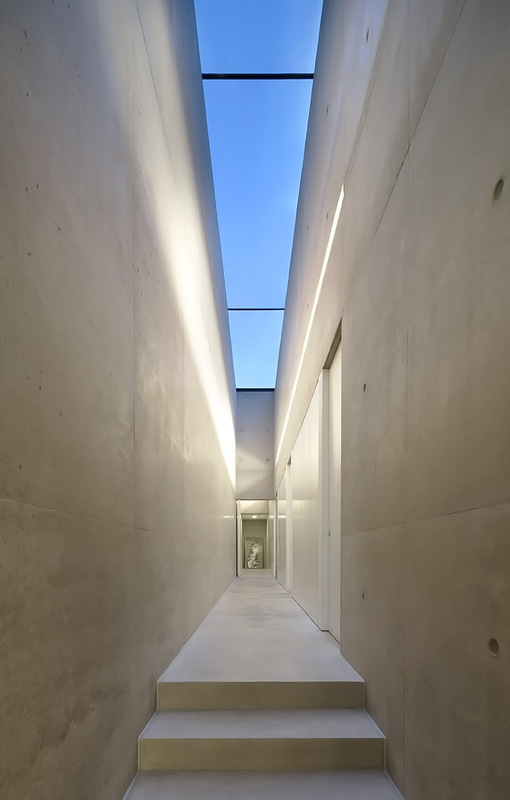 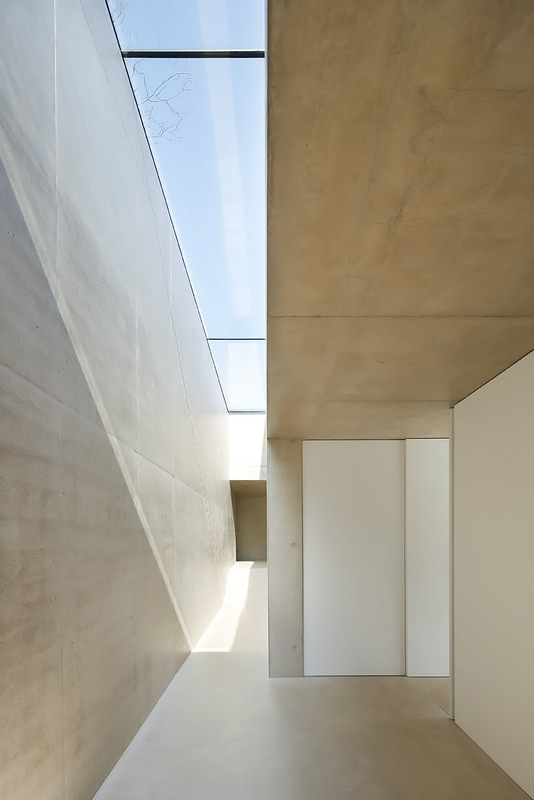 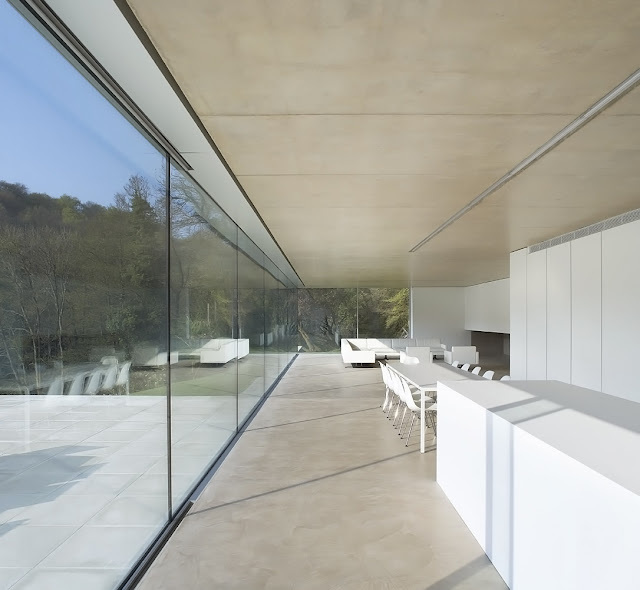 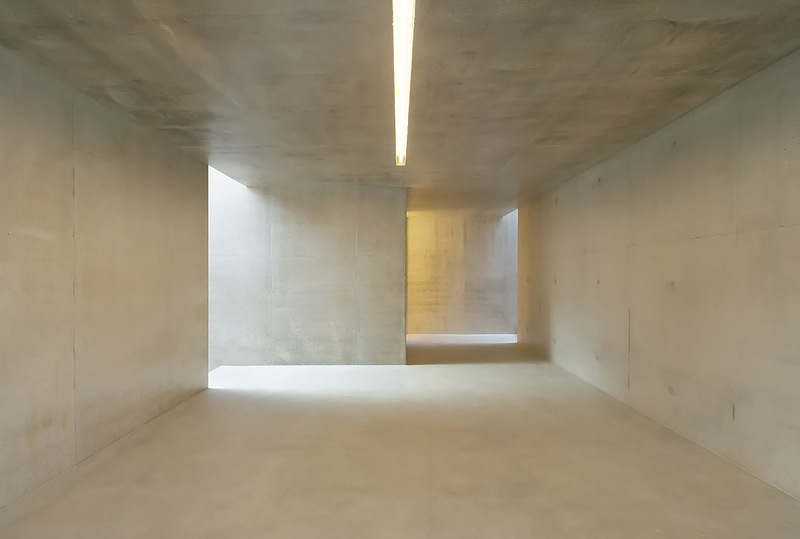 The property has won the RIBA National Award 2012 and was shortlisted for the RIBA Manser Medal 2012. 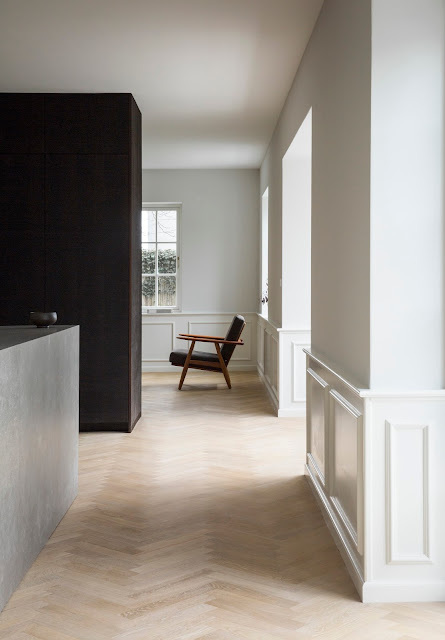 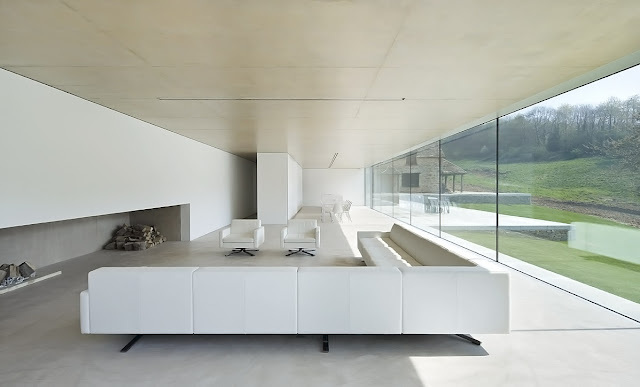 This is a project of great simplicity, in terms of materials and strategy and at the same time, considerable sophistication in its theatrical approach to space and light with both framed and expansive views and contrasting spatial events. 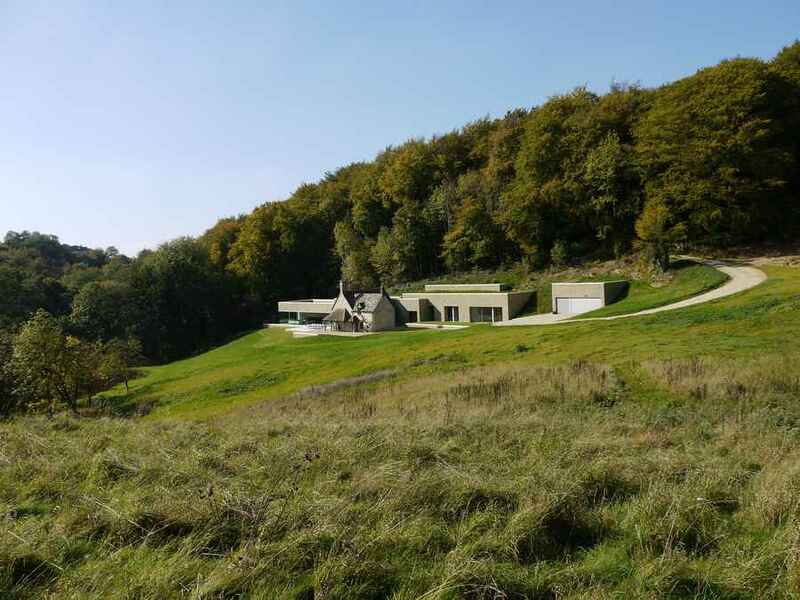 Externally the house is formed out of dry stone walls, a modern interpretation of the local vernacular, with sloping grass roofs – the slope burying the house into the hillside. 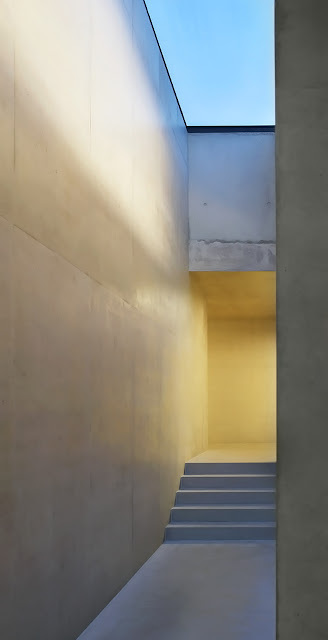 Internally the house is almost entirely concrete – floors walls and ceilings all formed out of a beautiful concrete, the warm tone of the local aggregates and sands creating a material that harmonises with the stone of the cottage and the new drystone walls. This project demonstrates a deep understanding of the site, with the retention and immaculate restoration of the cottage, adding to the richness of the overall project. 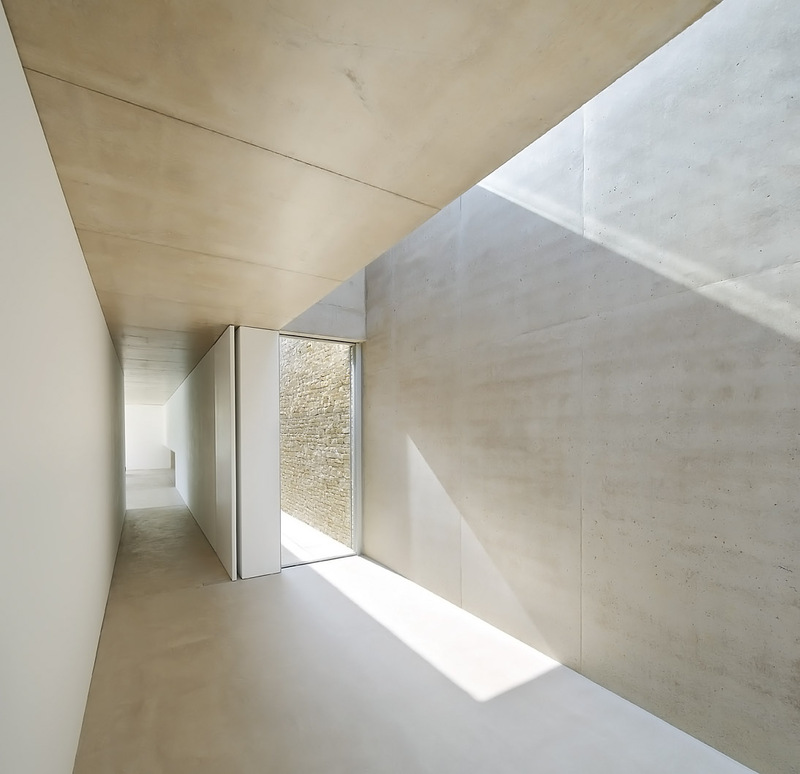 Throughout, the strong and elegant diagram is reinforced with a disciplined and considered approach to each component. 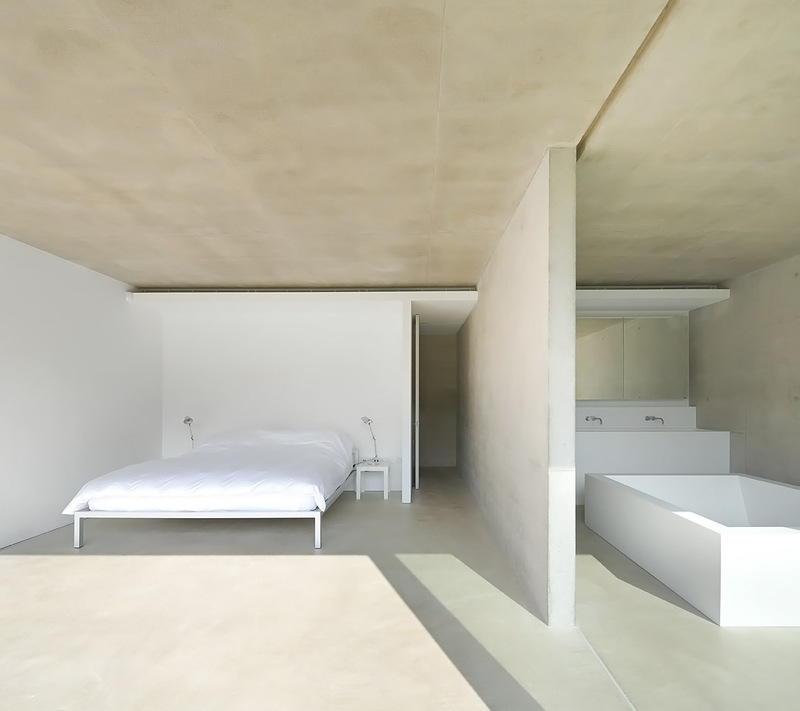 The use of materials, detailing and construction is flawless. 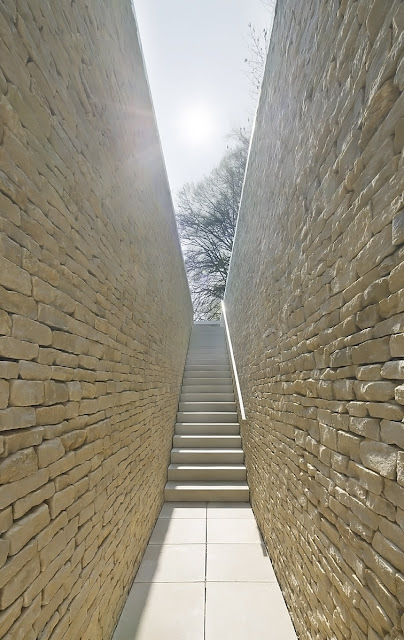 This is architecture that will only improve as the landscape matures and the drystone weathers.